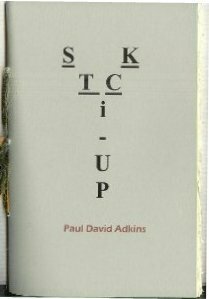 Stick Up, a chapbook by Paul David Adkins, manages to capture a lifetime of desperation - both successfully and compellingly - in a mere 21 pages of intense urban poetry. This series is about loss, losing, and having nothing to lose. The robber, a female whose long, hard life is exquisitely summed up by the current contents of her car - "a half-empty bottle/of Jack in the truck/and her wallet she stuffed/in the glove box/her creased AARP card/her license,/expired last month,/and a tucked photo/of the lover who left her," - is someone we all know, is someone we could become. She is closing in at the end of her life, and has come to a point where a fake gun and a chance to steal some potentially life-changing lottery tickets has become more palatable than continuing on her current path even one more day. A second point of view emerges from the purported heroes of this tale. The police officers vacillate between the desire for action and the desire for safety as they "prayed/for a quiet night. They prayed/for a night of gunfire." They struggle with the same indecision the average person deals with every day. Is a long life of mundanity preferable to one lived quickly but in the extreme? It is almost an uncomical moment of choice, the purpetual chance that lingers out there for all of us, the ghost of death whispering in our ear, Cancer or cut throat?, as if the outcome of both were not the same. Finally, Adkins has his hostages contemplating dairy products along with their lives, as if they are the mirror images of each other. In "He Considered the Dairy Products," one of these hostages' biggest concerns is "Will I die beside/the frozen yogurt light?" Not 'Will I die?' but 'Will I die here?' as if logistics was a factor in the fight or flight decision in these potentially last moments of breath. In "He Recalled as He Ran Back in the Store," another hostage actually refuses an offered opportunity to escape because he is fascinated by the robber. He sees her as the walking dead, a figure from a horror story he was told as a child: "She emerged from the tree line,/tall beneath the floodlit/Coors display,/her shadow sharp/and stark as the chalked/outline of a corpse." 'Round and 'round we go between these speakers as this literary Russian roulette of a merry-go-round ride spins us out of control and into this depraved and very human moment where there is no clear-cut victim or hero. Every one of Adkins' characters has flaws that are showing, and those flaws create an unbreakable bond of empathy that lures the reader to the edge of our seats, then dangles us there before an expected but powerful gunshot drop in "They Called for an Ambulance Though All Agreed": "there was no rush, no siren needed/for the robber, peppered,/dead amid the shards." Death, one of the universal inevitabilities, continues to linger on the horizon of this series just as surely as it landed on the floor in this convenience store, the blunt and bleeding culmination of humanity's emotionally devastating choices.